If you haven't been back to campus in awhile or if you're looking to introduce Baylor to a friend who has never had the privilege of visiting campus, then you're in luck. 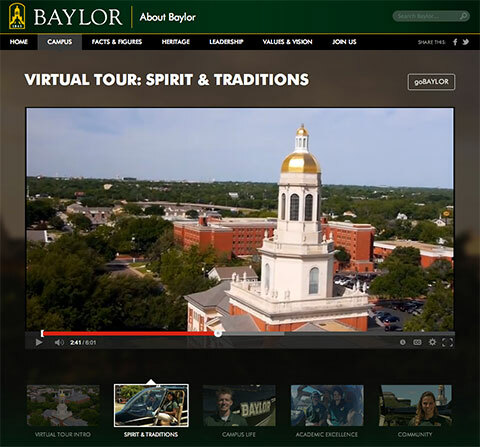 This past fall, Baylor launched its new Guided Virtual Tours. A series of four short videos gives viewers a sense of what Baylor is all about--not just the beautiful scenery (though that's a good start), but also the caring community, academic opportunities and storied traditions that make life as a Baylor student unique. The tours take visitors around, across and even above the Baylor campus, thanks to some breathtaking helicopter shots. Each video tour is narrated by Baylor students telling about their experiences here. Watching all four videos is enough to make any Baylor alum nostalgic, while also serving to remind current students of all that the University offers and providing prospective students an introduction to what the campus holds in store. Take the Virtual Tour at baylor.edu/VirtualTour. And if you know any high school students who are trying to decide on a college, pass the link their way and encourage them to visit Baylor themselves--either virtually or, better yet, in person.